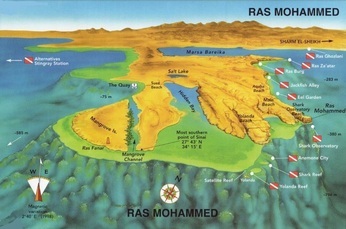 Ras Mohammed ‎ National Park is located at the southern extreme of the Sinai Peninsula, overlooking the Gulf of Suez on the west and the Gulf of Aqaba to the east. It is said that the name is from a wind-carved cliff in the area, which resembles the features of Prophet Muhammad, believed to have visited here in the 7th century. In 1983, the Egyptian Environmental Affairs Agency (EEAA) established the area as a marine reserve for the protection of marine and terrestrial wildlife. The park was also established to protect against urban sprawl from Sharm el-Sheikh and other coastal development. Surrounded by fringing coral reefs that emerged after a change in the coastline 70,000 years ago, the park is characterised by vertical overhangs at least 100m deep. Due to its location on the Sinai Peninsula at the juncture of the Gulf of Suez and the Gulf of Aqaba, the combining waters of varying salinity from each gulf has resulted in a spectacular array of reef and pelagic fish, diverse coral reef and luxuriant sea walls; ideal for some unforgettable Red Sea diving on the Sinai Peninsula. 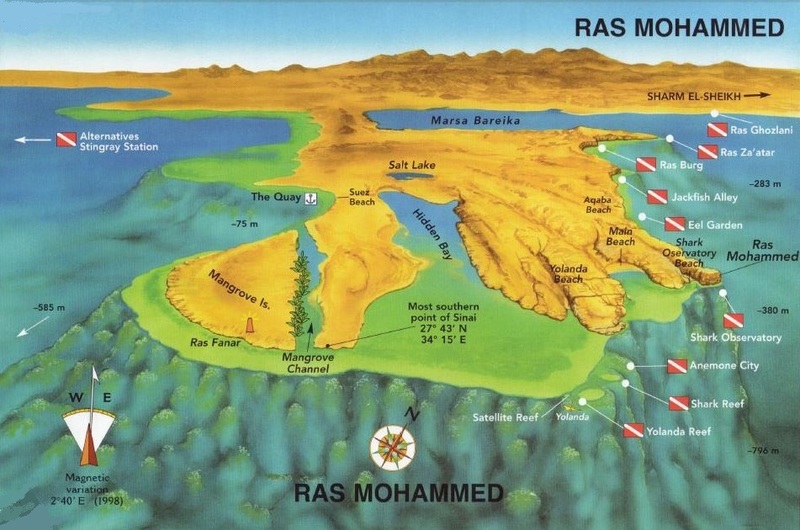 If Ras Mohamed is the most spectacular diving area near Sharm El Sheikh, then Shark Reef and Yolanda Reef are the prized diving spots of Ras Mohammed. These reefs offers an opportunity to spy every single species of fish of the Red Sea, right here in the Sinai Peninsula. Being not far from Anemone City, which is a good drop-in location, the site's eastern side is a sheer, vertical wall, illuminated by swarms of orange and purple anthias, along with black and white pullers dancing about the purple and orange soft coral trees. 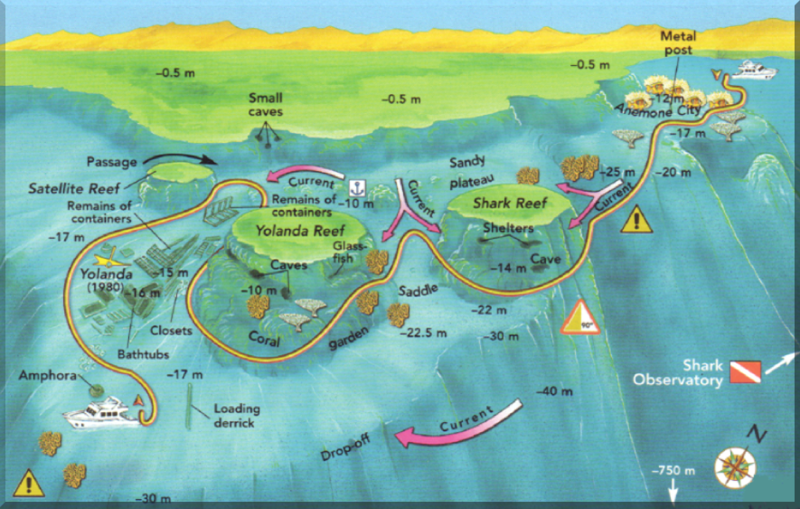 Keep an eye out in the blue when cruising past Shark Reef for the grey reef sharks which give this reef its name. A menagerie of pelagics can be seen here, including hammerheads and gigantic tuna. An ever present school of barracuda and snappers are residents and it's a great place for scuba divers to see Napoleon wrasse. The other side, facing the west, is much shallower and constitutes part of the plateau that surrounds Yolanda Reef. There are literally thousands of jackfish, batfish and all kinds of sting rays, giant moray eels and lyretail hogfish on the densely coralled saddle. Watch out for scorpionfish, rarely seen on the other dive sites but regularly spotted here. We usually finish our dive above the wreckage of the 'Yolanda', a wreck that made this reef its final resting place in the 70's. 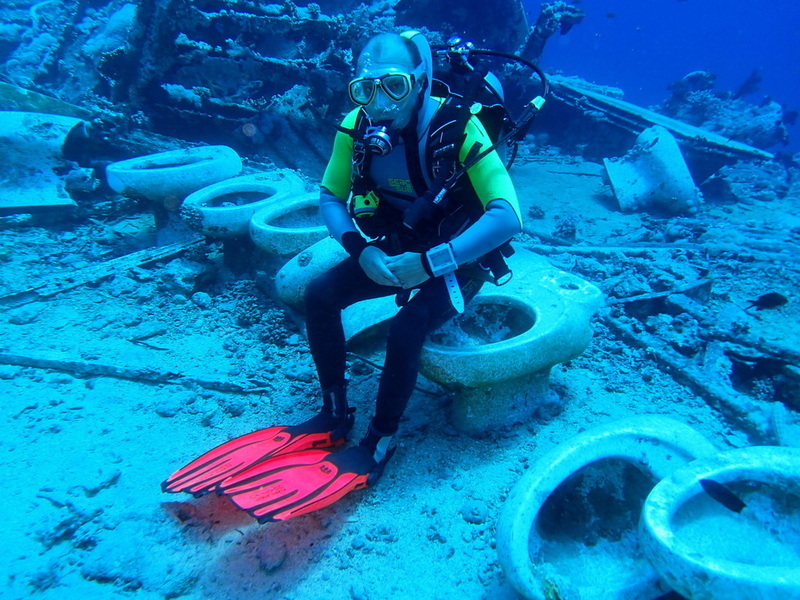 Its cargo of British standard toilets, bath tubs and pipe tubes remain on and forever as part of the shallow reef. If the current is strong when we enter the water we might find ourselves here quite quickly and enjoy the humorous sight of so many toilets on the sea floor. There is a place where there are 7 of them lined up in a row - a favourite spot for comedy photographs but beware of the fire coral if you are in a Shorty, or you may get off the loo with a stinging sensation.